One of Argentina's most notable ski resorts, Cerro Catedral is located in the Nahuel Huapí National Park in Patagonia, just eight miles (13 km) from the picturesque city of Bariloche in the majestic Andes Mountain Range. The stunning resort offers breathtaking views over the Nahuel Huapi Lake and the gateway city of Bariloche, famous for its trekking, climbing, chocolate and natural pristine beauty. No other Argentinean ski area rivals Bariloche in nightlife, dining out or entertainment and, with 600 hectares (1,482 acres) of skiable snow area, 57 runs of varying difficulties and 27 chairlifts, Cerro Catedral offers some of the best skiing facilities in South America. Bariloche features a great airport making getting to Cerro Catedral a quick and easy process - perfect for families travelling with kids. Head to Las Terrazas, the largest shopping centre in Cerro Catedral, which boasts around 50 shops that sell everything from ski wear and sporting goods to jewellery and fashionable clothing. The Amancay Paseo Plaza is also a good place to pick up a few souvenirs, while those wanting a little more variety should take the bus, which runs every 30 minutes, into Bariloche for a shopping experience that is second to none. Be sure to swing past a few of the chocolate stores while in Bariloche, as this is the chocolate capital of Argentina. There are a few restaurants and coffee shops around Cerro Catedral and the Amancay Paseo Plaza houses a large restaurant, but foodies looking for a larger variety of dining out options should head into Bariloche where everything from fast food outlets to nouveau cuisine eateries can be found. Try Familia Weiss, a popular eatery serving a little bit of everything and even featuring a children's menu, while Cerveceria Blest features a great dinner accompanied by local beers. Butterfly, with their decadent seven-course dinners, is the place to go for a special night out. Lively holidaymakers have come to the right place as Cerro Catedral and nearby Bariloche offer plenty in the way of nightlife to suit all ages and tastes. 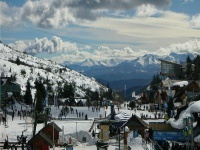 Most of the après-ski is centred around Bariloche, but this is easily reached from the base of Cerro Catedral. Head to the central plaza in Bariloche for a few drinks, where you'll find plenty of English-speaking tourists, or watch the sun set over the mountains and enjoy some of the local brew. Party animals can dance the night away on one of six storeys of dance floors at Grisu, while big spenders can put their poker face on for a night of gambling at the Club Hotel Catedral. During the winter months, Cerro Catedral's major attraction is, of course, its snow, which offers activities such as skiing, snowboarding, snowshoeing and tubing between June and October. The summer months, however, are just as lovely at this stunning resort and in the nearby city of Bariloche, where visitors flock to gorgeous beaches such as Villa Tacul or Playa Bonita to enjoy the sunshine. Popular activities include fishing, mountain trekking, climbing, mountain-biking and swimming. Being the most popular and famous ski area in South America, Bariloche can become extremely crowded during the winter months.